Mass Downloader is a powerful download manager that will allow you to download files at a speed that will surprise you. This speed is due to multichannel technology: using multiple connections for a single download. Furthermore, this manager allows downloads both via HTTP as well as FTP. In general, download managers use a single connection to the server, but Mass Downloader accelerates the process by connecting with various servers multiple times simultaneously. Each connection takes care of different parts of the file, so that it later synchronizes all the parts to manage the final download. 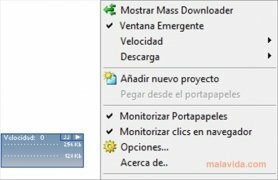 Mass Downloader has many options so that we can configure the downloads depending on our needs. Among them, we can vary the download speed depending on the priority that we want to give it. By means of an intuitive interface we can see all the details of the files and the downloads. It also has a hidden mode that will only show us a small box with the status of the downloads. This manager integrates with the most popular browsers: Internet Explorer, Firefox and Opera. Optimize your downloads with Mass Downloader and manage download speeds that you had never seen before.